Every year at this time, our various elected officials take the opportunity to discuss the state of affairs and conditions as they pertain to their various responsibilities. Usually they get to do it in front of a large group that feels the pressure to stand and applaud every so often, regardless of how they truly feel about the speaker and what he or she is saying. Now no one elected me to represent the various “Sports Nations” in these parts, but I am going to tell you how I think things are going right now. By the way, although I don’t expect you to stand, I will expect some polite applause when I’m done. I expect that even those of you who are only casual fans of football have a pretty good idea of what shape Patriots Nation is in right now. After winning their first 10 games, they limped to a 2-4 finish. They now stand at the beginning of the post season, preparing to defend their championship, in questionable physical shape. I think what concerns most of us is just how unusually poor the play has been in certain areas such as special teams and clock management–usually trademarks of Bill Belichick-coached teams. The Miami game was unusual in that most people who watched it came away with the sense that the Pats were far less concerned with winning than they were with trying to stay healthy. This was a strategy that almost backfired badly on them when Tom Brady came away with injured ribs and a sprained ankle. So, does that all mean I’m preparing to jump off the bandwagon? Although I might be backing away from my original 80% expectation level of them returning and repeating as Super Bowl Champs, I still believe they can do it, assuming they get a healthy Julian Edelman, as well as Dont’a Hightower back for the playoffs. Edelman’s return will take a great deal of pressure off the O line by speeding up the offense, and Hightower will strengthen their defense against the run–an important factor in the playoffs. Let’s face it, the AFC is the weaker conference, so you’ve got to respect their chances of getting out alive, especially if Denver loses and the Pats can stay at home. I expect I will be commenting further on this in the very near future. 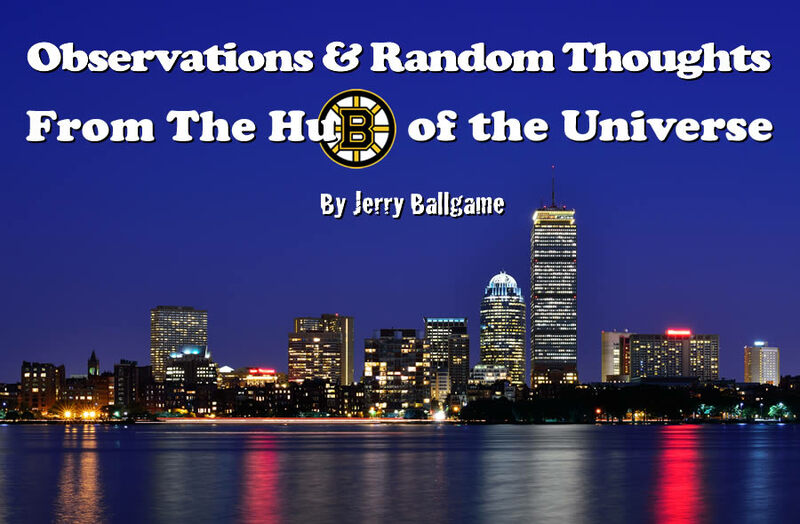 I’m lumping the residence of Causeway Street, namely the Bruins and Celtics, together because both of them, at times, have been fun and exciting to watch only to, for some reason or another, lose it and play frustratingly bad. The B’s stand at this point in 4th place in the Eastern Conference at 20-13-4. That would sound better, expect at least two different occasions they have been within one game of the top spot, only to lose badly and fall off the pace. The last time was on New Year’s Day when they played Montreal in the nationally televised Winter Classic, falling behind 74 seconds into the contest, never to even look competitive. Playing that game without the injured David Krejci (11-22-33) and the suspended Brad Marchand (15-11-26) didn’t help. Although I expect they’ll make the playoffs they feel like a second tier team to me, and will likely stay there unless some of their younger players come through, and soon. The Celtics are in 7th place in he Eastern Conference as I write this, with a 19-15 record, 10-6 on the road. They were coming off a four-game winning streak when they play the then undefeated defending Champion Golden State Warriors, pushing them to double overtime before losing. It seemed to take something out of them as they lost 4 of their next 5. Although they have righted the ship, mostly behind the play of guard Isaiah Thomas‘ 20.9 points, 6.8 asts a game, the general feeling is that they are playing very much for the future. The possible owners of four first round picks, they appear to be hoping to trade for a star and impress him enough to want to stay. We’ll see.